I know you get my point. These cars were bulky, heavy, and not really in the mix for fast muscle cars. Yes the 383 was a big engine but it was squeezed by emissions and weight. 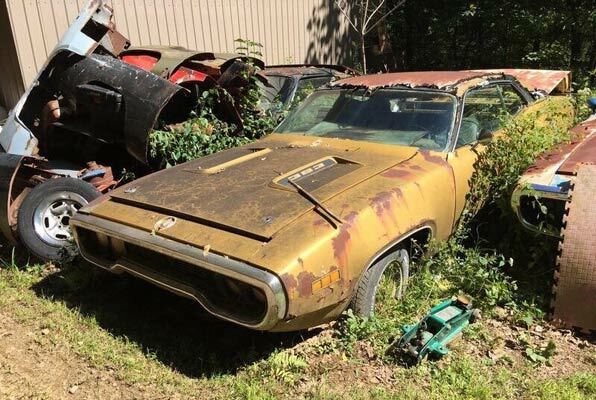 But, if I am a collector and it takes 50k just for a basic ’70 Road Runner with a 440 maybe I should look elsewhere. Yes, this model is getting hot. Why? Well, not just for the reasons above but technology. Today we can drop in a Viper engine, a crate engine and an array of transmissions. So, even if the car is a bit heavy we can make her go very fast. Yes the styling is still good and there seems to be many of these bodies around. It’s a good thing when our hobby expands its horizons. I mean we cannot all enjoy classic year Z28’s, Vettes, Chargers, and Chevelles. All we would do is buy and sell the same cars to each other. We need new blood and new cars to make classics again. It opens the doors to new people and new ideas. I saw a picture on a web site the other day and there must have been fifteen of these body styles sitting in a field. That’s gold baby. Go get those cars and restore them. I drove a car years ago with the 383 and it was fast enough. I could only imagine if I could take that same engine and make it really good. Same with the 440. That engine has all kinds of room for improvement. So, in conclusion let’s go out and make some new products to love. Trust me, when I go to the big shows it seems like all that goes down the runway are the same cars. How many times can I watch a C2 Corvette be sold? Then right after that a slew of Chevelle’s. Yawn. It gets boring so if this is what we need to do to righten the ship and pump new people into our hobby then let’s roll.